If you are a small business owner, freelancer, or own a business and want to learn more about yourself, learn how to work with or manage others better, and identify potential opportunities for greater success in your career– than you might want to consider taking the Myers-Briggs Personality Inventory and getting Myers-Briggs Coaching. The Myers Briggs Type Indicator (MBTI) is one of the most respected and popular personality type tools in the world. It is a personality assessment tool created by Katharine Cook Briggs and her daughter Isabel Briggs Myers based on the theory of “Psychological Types” created by Swiss Psychiatrist Carl Jung. Carl Jung published his ideas on personality type in his 1921 book “Psychological Types.” One of the core principles of Jung’s model is that each person has an innate urge to grow as a person. And he believed that part of each person’s growing process is to learn how we each operate individually, develop the parts of us that we need to learn more about, and learn about the people with whom we come in contact. At the core of Carl Jung’s theory is his belief that there are four principal psychological functions by which humans experience the world – sensation, intuition, feeling, and thinking – and that one of these four functions is dominant for each person most of the time. Katharine Cook Briggs and her daughter Isabel Briggs Myers were both were perceptive observers of human behavior and wanted to put Carl Jung’s work on the theory of psychological type to practical use. At the start of World War II, Isabel Briggs Myers wanted to use a personality type indicator as a way to help people understand, rather than kill each other. She also noticed during wartime that a significant number of people had to accept jobs that they did not like to support the war efforts. She noticed that many people hated their jobs because the jobs did not allow them any opportunity to use their work skills and talents, and these jobs also were not a good fit with their personalities. She created the Myers-Briggs Type Indicator so she could put Carl Jung’s ideas about Psychological Type to practical use. Career planning and transition—helps guide individuals on appropriate career choice, career development, and planning. People learn how some personality types are better suited for certain jobs. People learning where they score on the Myers-Briggs can enable them to understand where they’re most comfortable and why. For example, If you learn that you are an introverted-sensing personality type, you may be more comfortable working in a smaller, structured setting, while someone whose preference is extroverted-feeling may prefer a larger agency where there is more interaction and collaboration with colleagues. Although there may be copycat sites for taking the assessment online, or you may have taken it in high school- please note that copycat instruments are typically not developed to the same psychometric standards as the original MBTI instrument. In addition, the value to the assessment is not the test itself, but in the interpretation and application of the type in the coaching process by a certified practitioner. A central tenet of MBTI practice is that each individual is the best judge of their own personality. In the coaching process, they will therefore discover relevant truths for themselves and will apply lessons learned in their career and personal life. This is the reason that taking the MBTI instrument through a certified provider is distinctly more powerful than just filling in an online questionnaire and being given your results. Take The Myers-Briggs Type Indicator® (MBTI®) Step II Assessment! MBTI Step II (Form Q): Delves beyond the 4-letter type framework proposed by Step I and uncovers the many different facets of type that make each individual unique. The report is based on 144 questions and includes the Step I assessment plus 93 additional questions. 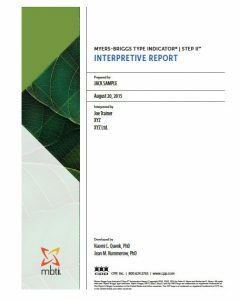 The Step II report provides deeply personalized insights and is perfect for coaching, action planning and building cohesive teams. Taking the Myers-Briggs (MBTI online) is easy, takes approximately 35-45 minutes to complete and can be done online or in-person with paper and pencil. You fill out a multiple choice questionnaire and there are no right or wrong answers. The MBTI instrument is not a test. You select the answers that offer the best fit for you. It is very important to note again that the assessment can only be administered through a certified individual who has met certain professional requirements for interpreting the results of the instrument and coaching after you take the instrument is a necessary and vital part of the process. We offer a one-hour telephone or video feedback session once your report has been completed. We provide you with a personalized interpretive report detailing your results which will be emailed to you prior to the session. Kessler Coaching maximizes your experience with the MBTI instrument by including a one-hour personal coaching feedback session delivered by a certified MBTI practitioner with extensive experience in helping others understand their results. Your feedback provider will explain your results in detail, helping you to discover your “best-fit” personality type, and suggesting ways to use this information to help you gain personal insights that apply to work, home, and relationships. Kessler Coaching will walk you through the entire procedure. Think of this as your personal growth concierge service, guiding you through a revelatory process of self-discovery. Want to Change Jobs Or Explore Careers That Might Be Best For Your Personality? Call us at 781-956-9999 to schedule your session or if you have any questions.